In my last post, I showed you why Artificial Light Is Better Than Natural Light. 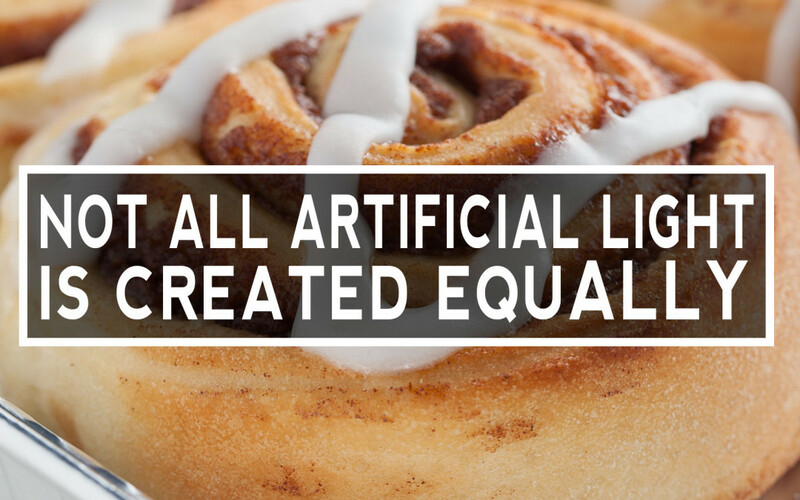 This is true, but unfortunately, not all artificial light is created equally. Let’s take a look at two images of the same subject. 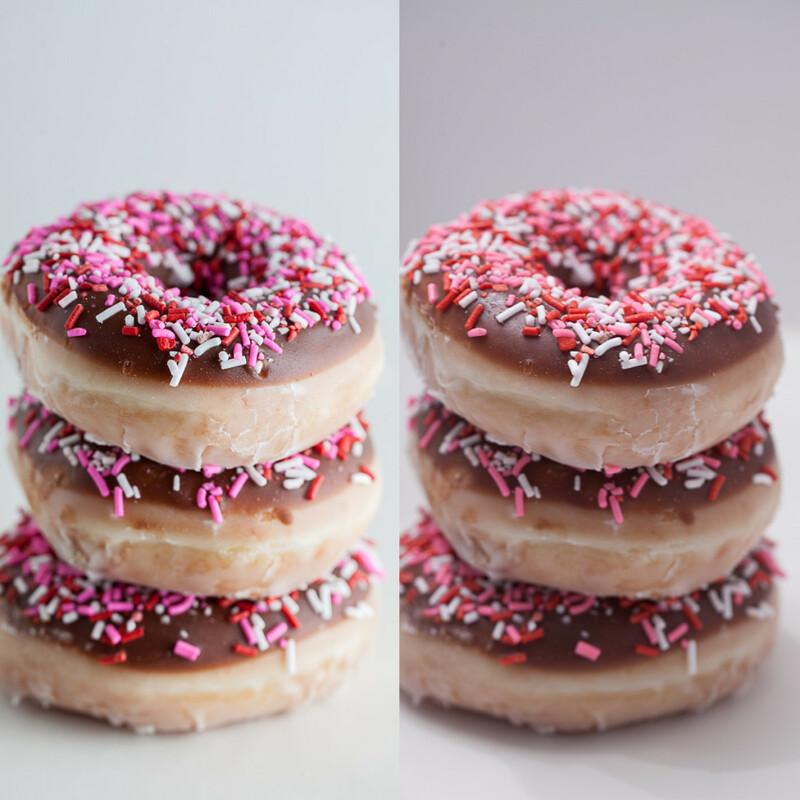 Keep in mind that both images use the same camera, same lens, and both are taken in Auto White Balance mode. The only difference is the lighting. Okay, I know what you are thinking. The one on the right is way too orange and needs to be shot with a tungsten white balance. Fair enough. Below is the same image as above, but with the image on the right white balanced. So which do you like better? Left or right? Here are the lighting diagrams that will show you the two different artificial light sources used. On the left is a small battery powered flash. On the right is an overhead tungsten light. These are both artificial light sources, but they give completely different looks! So what’s different about these two lights? The main differences are in the color, quality, and direction of the light sources. Yes, you can just turn on a light and take a picture like in the overhead tungsten light example, but to create a picture that rivals that of daylight, there are a few more things to think about. 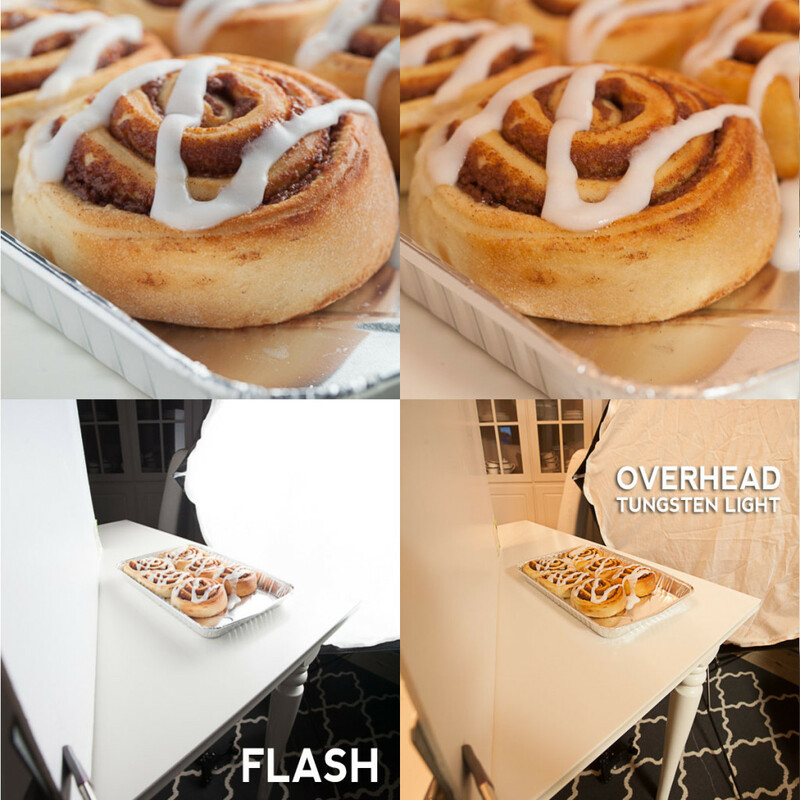 Here is another example of a cinnamon roll shot with our two different artificial light sources. Again, all things but the light source are the same. Again, there are two very different looks. To make things simpler, let’s use the same light source shining from the same direction. Let’s take a look at how the quality of the light will change when you use different modifiers. Notice the subtle changes created by each modifier. 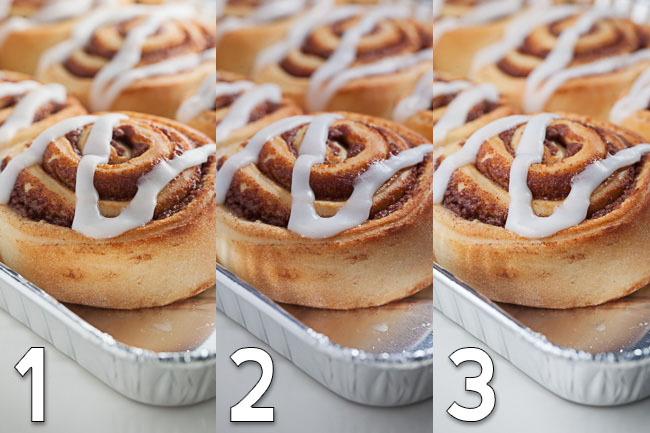 Look at the highlights, shadows, and small details on the cinnamon rolls. 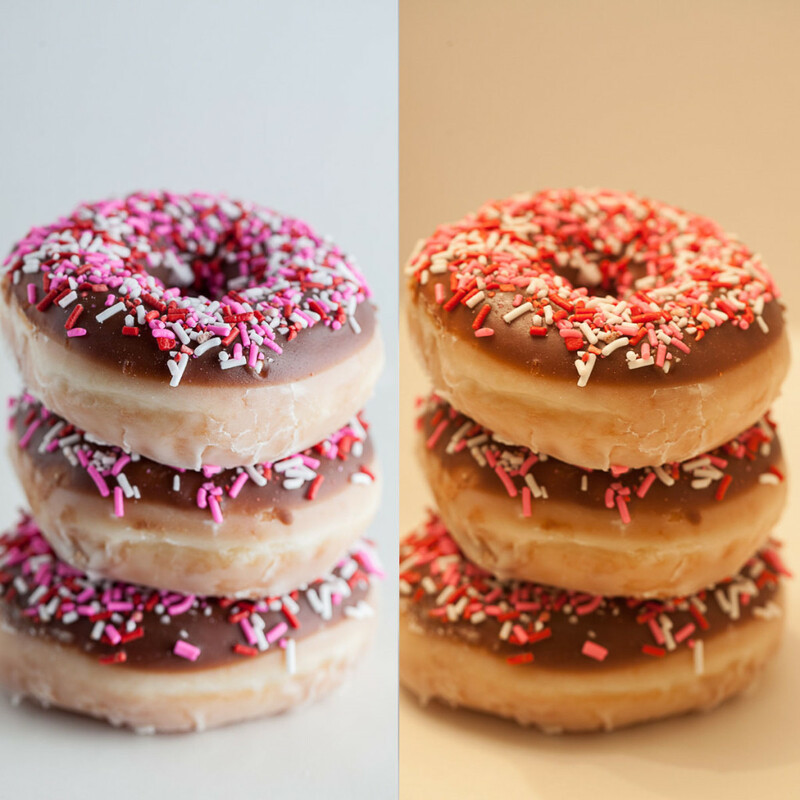 The differences between the light modifiers are subtle, but there are differences. Now let’s take a look at the modifiers that went into making these three shots. Shot 1 was made with a Yonguno Flash and Apollo Westcott 43″ Orb. 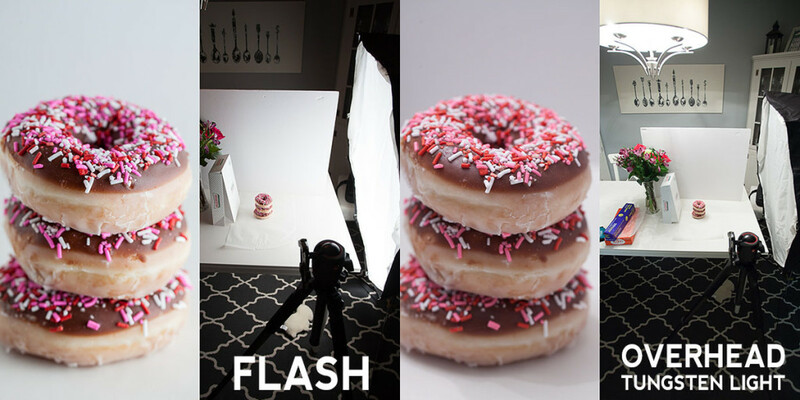 Shot 2 was made with the FStoppers Flash Disc. Shot 3 was made with a bare bulb flash. In all three of these shots the light was placed to the back/right of the subject with a white foam board reflector placed to the front left of the subject. I hope that you now understand that not all artificial light is created equally! 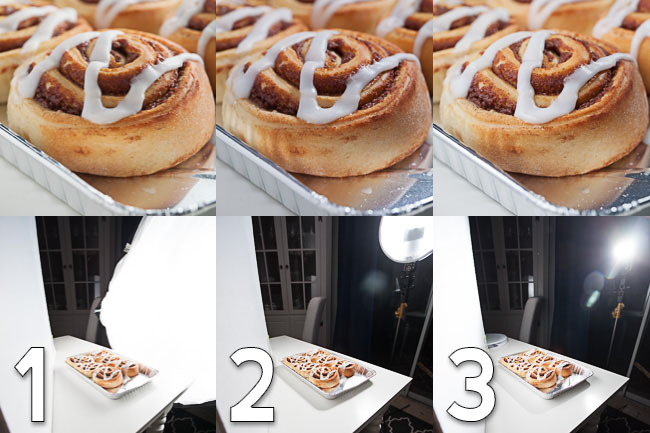 If you’re interested in learning how you can create the artificial light that will look like beautiful natural daylight, check out photographing FOOD Issues 1,3, and 8. 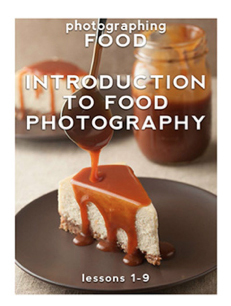 Sign up to receive these 9 mini-lessons that will instantly improve your food photography!